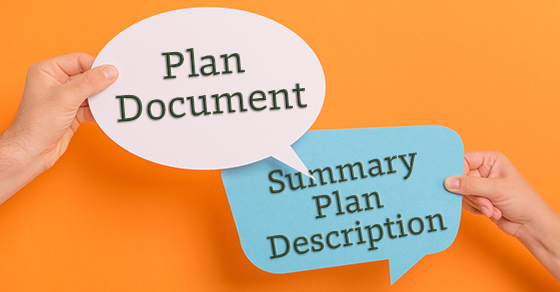 What’s the difference between a plan document and an SPD? Most of the health and welfare plans offered by employers today are subject to the Employee Retirement Income Security Act of 1974 (ERISA). Generally, ERISA envisions that employee benefit plans will have both a plan document and a summary plan description (SPD). But, in some cases, a single document may serve both purposes. Let’s look at the difference between the two and under what circumstances they may be combined. • The procedures for allocating plan responsibilities. The plan document also guides the plan sponsor and plan administrator in making decisions and executing their responsibilities. • A statement of participants’ ERISA rights. The SPD must be written in a manner calculated to be understood by the average plan participant and must be furnished at specific times to specific individuals. Some health and welfare plans use a single document as both the plan document and SPD. If this approach is taken, the document must comply with both ERISA’s written plan document requirements and its SPD format and content rules. Some courts and commentators have expressed the view that a combined plan document and SPD is unacceptable because it’s impossible for a document to summarize itself. But at least two appellate courts have approved the combined approach for welfare plans. Participants and beneficiaries may request copies of the plan document and the SPD. Failure to furnish the documents within 30 days after the request may expose the ERISA plan administrator (typically the employer) to penalties of up to $110 per day — even if either document was already provided in the normal course, as may be the case with the SPD. Finally, note that for group health plans a summary of benefits and coverage (SBC) is also required but is separate from and in addition to the plan document and the SPD. For more information, contact us.